Given my adoration of this soup, you’d think I would have attempted to make it before. But surprisingly, I never did. I always just made the hideously incorrect assumption that getting those lovely egg ribbons would be too complicated or would take too long to make. How WRONG I was! I’m so glad I came to my senses and decided to give this soup a go. If you adore this soup as much as I do, but have always wondered how to make egg drop soup, you came to the right place today. To begin with, this dish requires just a handful of ingredients, most of which you probably already have on hand. Secondly, it’s only going to take you about 10 minutes, so you don’t need a lot of time. Once you’ve given this egg drop soup recipe a try as is, I would absolutely encourage you to try a few different variables with it. For example, if I’m planning to eat this soup as the main course of my meal, I’ll add some tofu and/or mushrooms to bulk it up and give it more sustenance. If I’m planning to serve it as a side, I’ll either keep it as is or add in a handful of fresh spinach or chard. Generally, egg drop soup is considered an appetizer, but hey…if I can get creative with it, and have it as a main course, why not? While traditional egg drop soup recipes are very simplistic in flavor, there’s no reason you can’t spice it up a bit, if you should so desire. Add in a dash or two of sriracha or perhaps a touch of Yuzu Sauce to add a little acidity and heat. 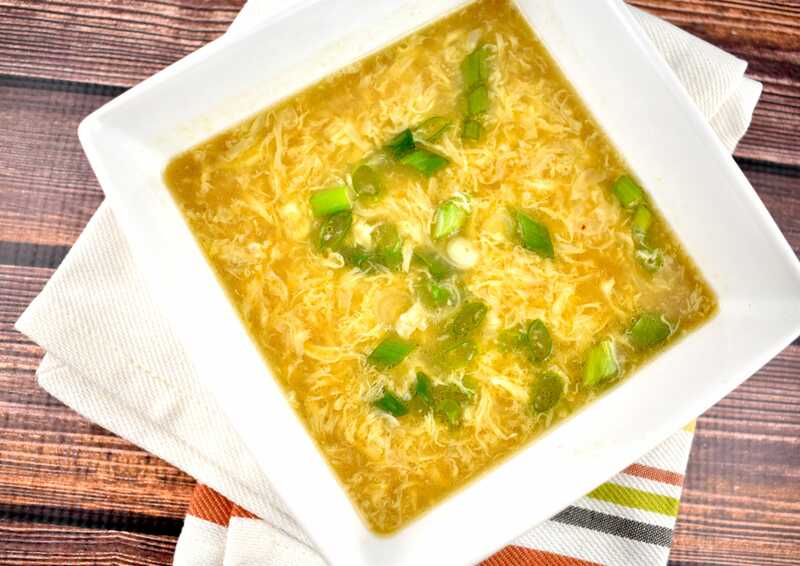 Any way you decide to try it, this easy Egg Drop Soup will taste just like the one from your favorite Chinese restaurant, only better and healthier. Hope you enjoy this one! A savory soup that’s tough to beat when you need a quick, easy, and satisfying meal. Egg Drop Soup is so soothing and comforting, and the perfect pick me up lunch recipe for a chilly day. In a small saucepan, whisk the broth, ginger, white pepper, soy sauce, and cornstarch together, over high heat, until no lumps remain. Bring to a boil, occasionally stirring. Once soup is bowling, remove from heat. Then, while whisking the soup in a circular motion, slowly pour in the eggs, to create egg ribbons. Stir in sesame oil, and top with green onions. Serve immediately.